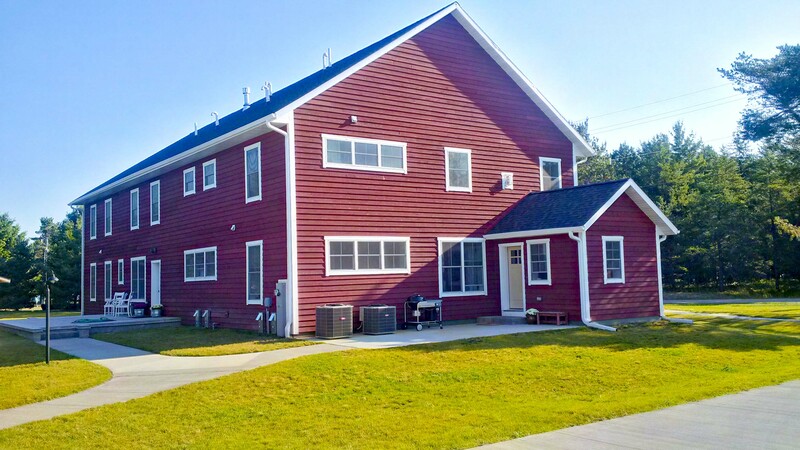 Discover how Nestledown B&B uses BuildBlock ICFs to create energy-efficient lodging as a leader in energy conservation & providing comfort for their guests on the shores of Lake Superior. 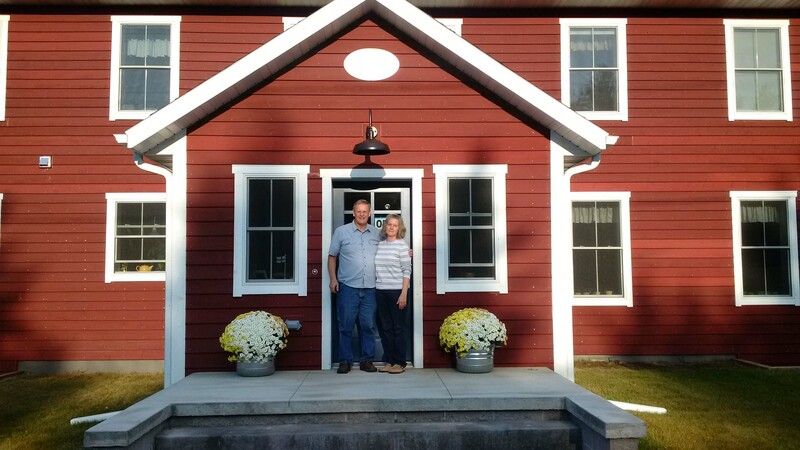 The Schauland’s, Ken and Sue, set out to create their dream job, owning a bed and breakfast even though neither of them had ever worked in hospitality or specialized in construction. Ken is a drywall contractor and his wife Sue is a pediatric nurse at St. Vincent’s hospital in Wisconsin. Nestledown B&B uses BuildBlock ICFs to create efficient lodging for themselves and their guests. 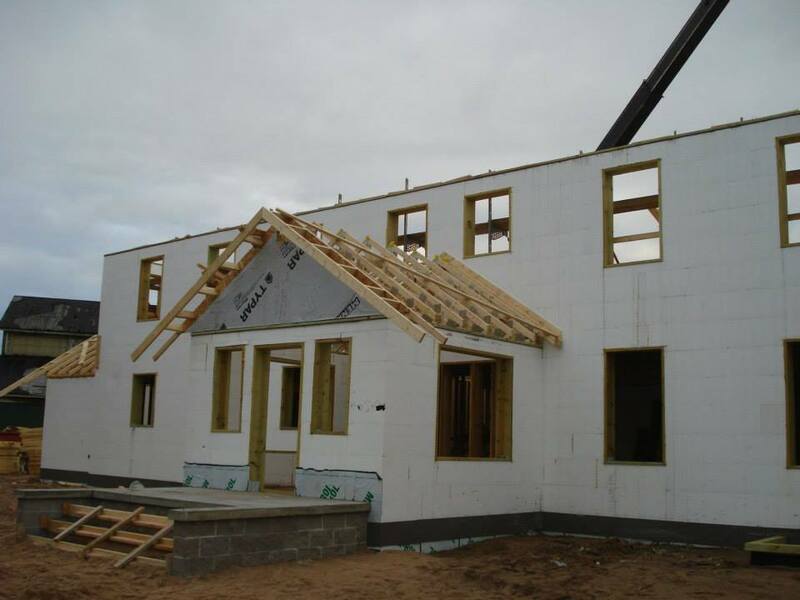 When deciding to build this project they chose BuildBlock ICFs because of their comfort level with the products, technology and the service and support of their BuildBlock ICF distributor, Associated Redi-Mix (associatedredimix.com) close by in Marquette, Michigan. As a bed and breakfast, comfort and quiet were overarching concerns during design and construction. Nestledown Bed & Breakfast (www.nestledownmarquette.com) consists of the main building, an attached garage with small apartment above and storage shed. The owners, architect, and designers took their inspiration from a colonial style with strong Scandinavian influences. This building would feel right at home in Sweden or Norway. Nestledown is located along the main drive in Marquette, Michigan and many cars and trucks pass along day and night. ICFs were chosen for the sound and noise attenuation. The architect on the project was John Larsen who collaborated with the Schauland’s over long distances. Mike Lempinen was a designer on the project and Robert Combensy was the engineer. Working with Brian Lindberg with Associated Redi-Mix and Dennis Micoff, BuildBlock’s Technical Director, and many subcontractors and professionals, the Schauland’s with their team have truly created a comfortable respite on the shores of Lake Superior. The narrow site was a nightmare to deal with from the beginning. In previous generations, the site was the home to a smelter and foundry, but it closed in the 1990s. The site was polluted and zoning limited what was possible on the site. Commercial applications were acceptable, but a residential property was not. Using the property as a Bed & Breakfast, while very popular locally, was a challenge with the state. 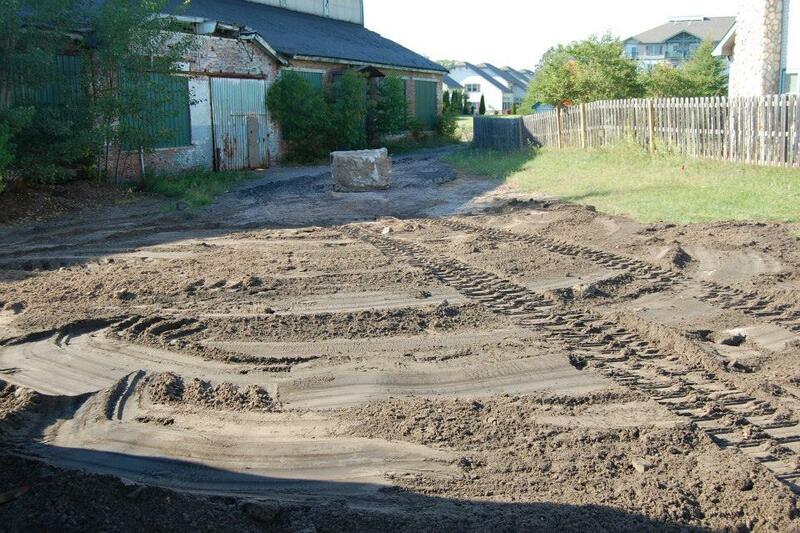 The remediation required by the state involved bringing in an additional 6” of topsoil to cover the entire property. An adjacent property had undergone the same process years earlier. The owners spent several months moving through a Planned Urban Development process with the city and the state. One additional challenge is that local residents, though desiring a B&B, didn’t want to rezone the area that could eventually host a business they wouldn’t like. The PUD process left zoning in place, but created special setbacks and loosened requirements specifically for the B&B. In the end, after the required clean up and remediation, the site was approved for a B&B. With the property purchased and plans approved by the State of Michigan Department of Environmental Quality, it was time to begin preparing the site. On the existing site was a condemned 100’x34’ three-story pattern building that needed to be demolished. The owners began that process reclaiming what materials they could. In the end, the timbers that frame the hearth are from the main posts of the pattern building. The project began with good overall weather on August 28th, 2014. On November 10th the snow began and the ICFs were the only reason the project could move so quickly and beat the snow. Even more so since project construction was self-performed. Once the walls were up, ICFs made finishing the inside easy and comfortable, even with just temporary heat. Based on the construction schedule it was very tight once the prep work was completed. In actuality, the ICFs were completed one week before the snow season began. They quickly set the roof trusses and continued construction right on schedule. The layout of the main building is fairly straightforward, but there are numerous bedrooms, partition walls, and bathrooms since the primary use is as a bed & breakfast hotel. One of the complex features during construction was a 9-foot window on the top floor. This span was a challenge to ensure the lintel depth was sufficient and reinforced correctly. One challenge with windows in a commercial building is the bottom of the window must be at least 24-inches from the floor to prevent small children from falling out. This shifted the initial placement of some windows, creating challenges with wall heights and lintels. Also notable was the care is given to interior soundproofing. There is significant sound isolation between rooms and floors. In the bedrooms, the interior walls are built with staggered 2×4 studs and the cavities are filled with fiberglass insulation between rooms. Putty packs are used around outlets and openings to acoustically isolate the rooms from each other. Further, the walls and ceilings use 2 layers of 5/8” drywall sandwiched with green glue, adding to the noise dampening. The floors and ceilings use sound isolation clips on the joists and fiberglass insulation was added between the floors. The ceilings also use 2 layers of 5/8” drywall with green glue for added sound reduction.The exterior door frame to each room has a threshold to keep hall noise at a minimum and prevent temperature fluctuations from the hallway. Most windows can be opened without affecting other guests or the rest of the structure. After the red siding was installed the bright red color makes Nestledown B&B a beacon to travelers passing by. Residents and guests are constantly amazed how quiet and comfortable it is inside. The more buildings that are built, the more the public learns. The B&B impacts more than just a residential home, it gets many visitors each month and the construction method is a topic of conversation. This project exemplifies how even small to moderate size structures can cost-effectively be built with ICFs. 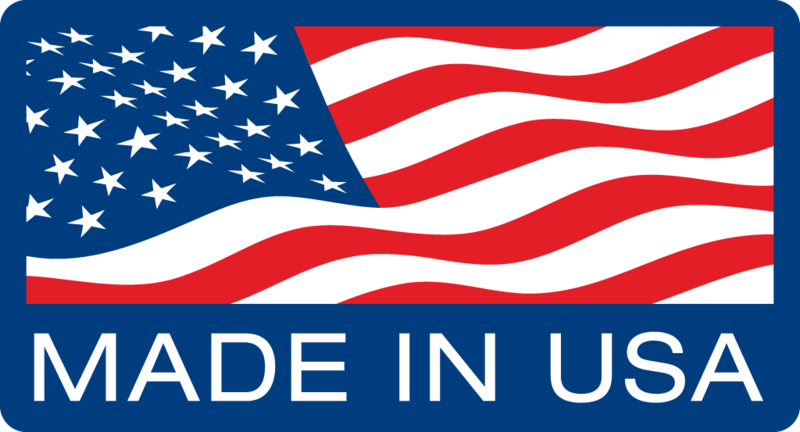 ICFs make construction approachable even for someone with little construction background. The public can take basic training information and with the support of a good distributor, build a structure such as this. Subcontractors have been very impressed by the ease of working with ICFs and the comfort of doing so in the winter months. 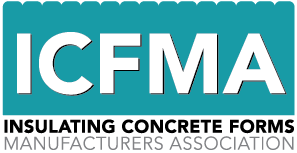 Several others have decided to b­uild ICF homes because of this project and local officials have expressed interest in developing future town buildings with this technology. “It’s not a fancy building, but it’s home.” – Ken Schauland,owner.